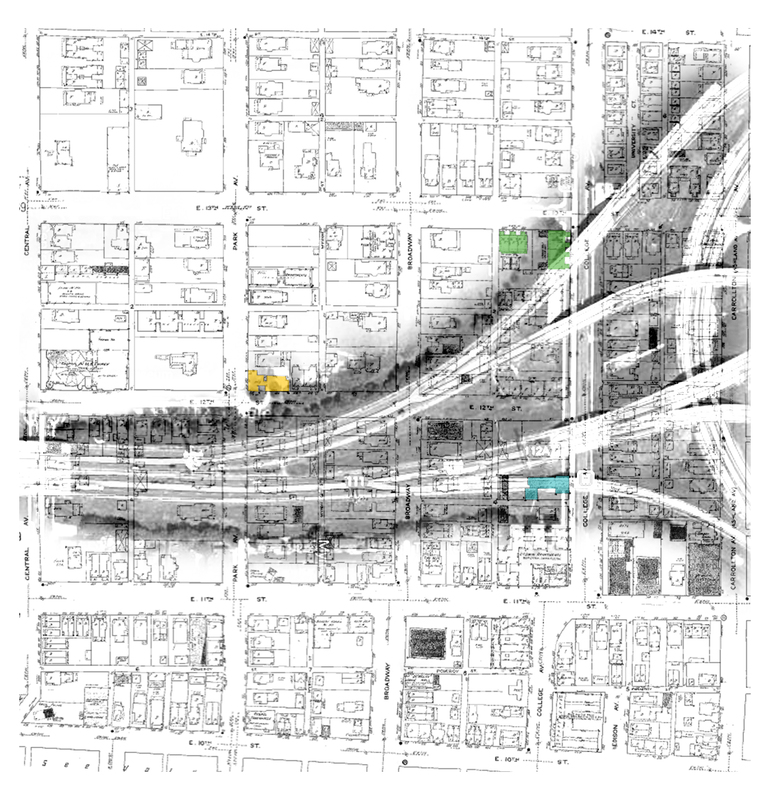 The Sanborn map above is of the intersection of Massachusetts Avenue, Vermont Street, and Alabama Street in 1914. Originally, the 400 block of Mass Ave was set aside for ‘religious purposes.’ However, by 1870, the area had established its popularity as a main shopping corridor surrounded by residential blocks. According to the National Register of Historic Places – Massachusetts Avenue Commercial District Nomination Form from 1977, the most “striking physical characteristic of the district as a whole is the uniformity of size, scale, materials, style, and age of the commercial buildings.” This is apparent in many of the buildings on Mass Ave, particularly the Oxford and Marietta flats. 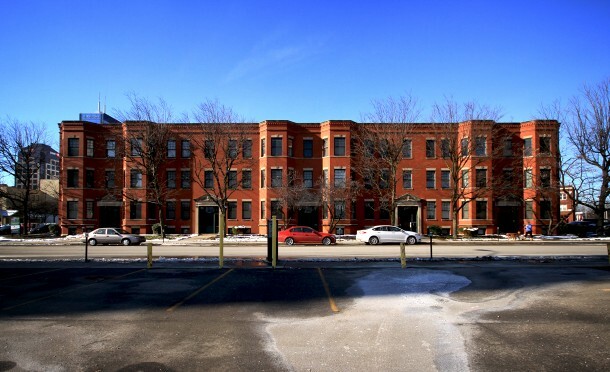 The Alexandra, now called Lockerbie Courts, is located at 332-336 East Vermont Street & 400-416 North New Jersey Street. Built in 1902, the three-story brick building contains thirteen units and twelve foot tall ceilings. The building permit was issued to Catherine M. Lewis for a flat valued at $50,000. Lewis was the widow of Tompkins A. Lewis, owner of a flouring mill in the 1870’s; she resided at 528 North Meridian Street. She died in 1904 and was buried in Crown Hill. In 1909, advertisements listed a flat here for only $12.50/month. One advertisement from December of 1921 stated that the apartments contained seven rooms plus bath, heat, water, range, and fridge. The name most likely comes from the interest in England’s coronation of Edward VII and his wife Alexandra, after the death of Queen Victoria. 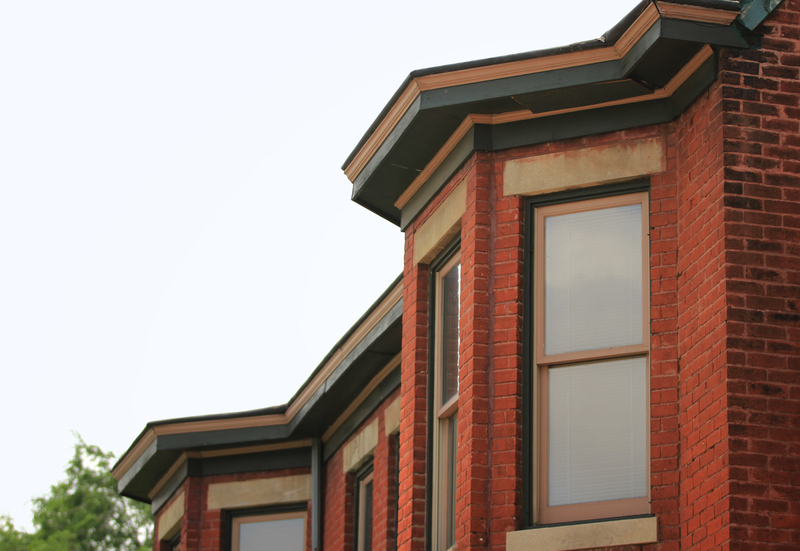 The Alexandra’s architecture is a mixture of Italianate Revival and Romanesque Revival. The horizontal emphasis, low pitch roof, and string-course between the first floor and basement are examples of the Italianate Revival style. It is also Romanesque Revival because of the heavy lintels and sills, the detailed brick cornice, and the select keystones above the doors and bay windows. From New Jersey Street, the building has an enlarged eastern-style flat appearance. One unique feature of the structure is the repeated, three-story projecting polygonal bays – there are six on New Jersey Street and two on Vermont Street. 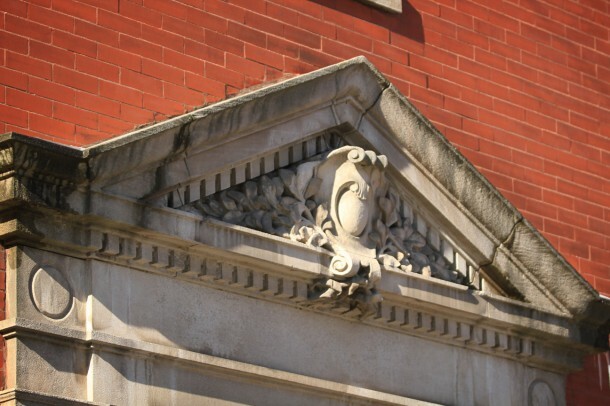 Another interesting element is the Georgian Revival style pediments above the entrances made of limestone. Besides being so close to the huge shopping destination of Mass Ave, the Alexandra also had interesting neighbors on New Jersey Street. The Athenaeum is half a block away and before the Sears, Roebuck and Co. building, there was a public school in the location. In 1927, many of the lots surrounding the area were brick and wood frame homes and duplexes. 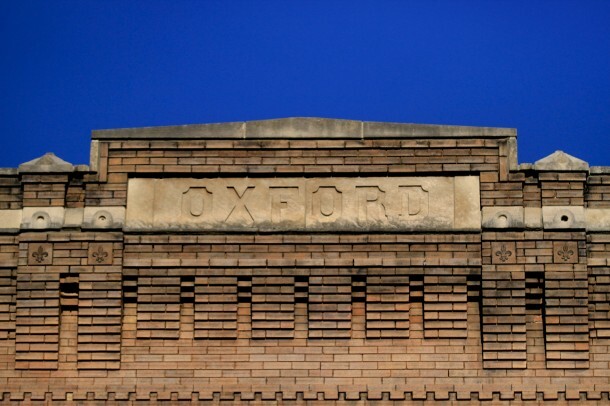 Built in 1902, the Oxford is located at 312-316 East Vermont Street and 405-413 Massachusetts Avenue. The building, now with Mass Ave Toys on the first floor, wraps around Old Point Tavern (built in 1887) with facades on Vermont Street and Mass Ave. In May of 1902, a building permit was issued to Frank Shellhouse, listed in the 1902 city directory under “real estate, fire insurance, storage of all kinds, and dealer in coal and coke.” The construction was valued at $7,000 and was completed by contractor C.F. Moore. The Oxford has a six bay entrance on Vermont Street and a ten bay entrance on Mass Ave. 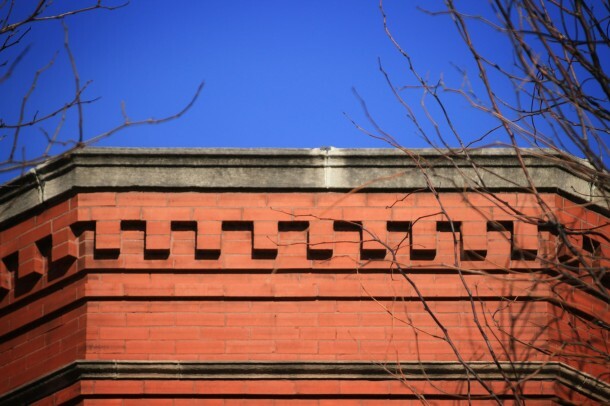 Originally, the three-story brick building was designed as a mixed-use commercial building with shops on the first floor and eleven sleeping rooms on the upper two floors. An advertisement from 1909 describes the twelve and sixteen foot tall ceiling flats as four rooms plus a bath and steam heat for only $27.50/month. By the next year, they had added electricity; flats were all divided into three room suites and five room suites. Like the Alexandra, the Oxford’s architectural style is a mix of Italianate Revival and Romanesque Revival. The Italianate Revival style is apparent in the horizontal emphasis, columns on Vermont Street entrances, and metal string-course above the first floor. It is also Romanesque Revival because of the arched door openings, heavy lintels and sills, and detailed brick cornices. 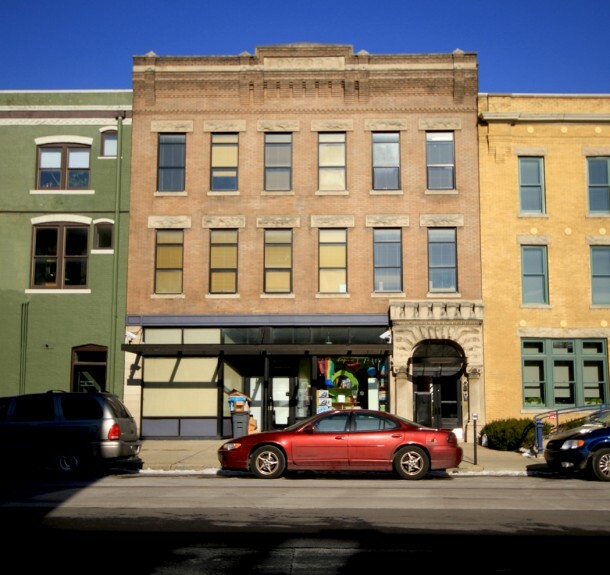 The Alexandra and Oxford flats were included in the National Register of Historic Places Nomination Form for Apartments and Flats. 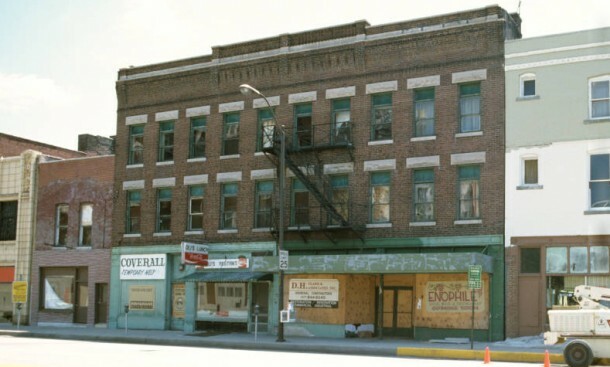 In 1983, the owners of the Oxford also owned the Wil-Fra-Mar flats next door, another nominee. 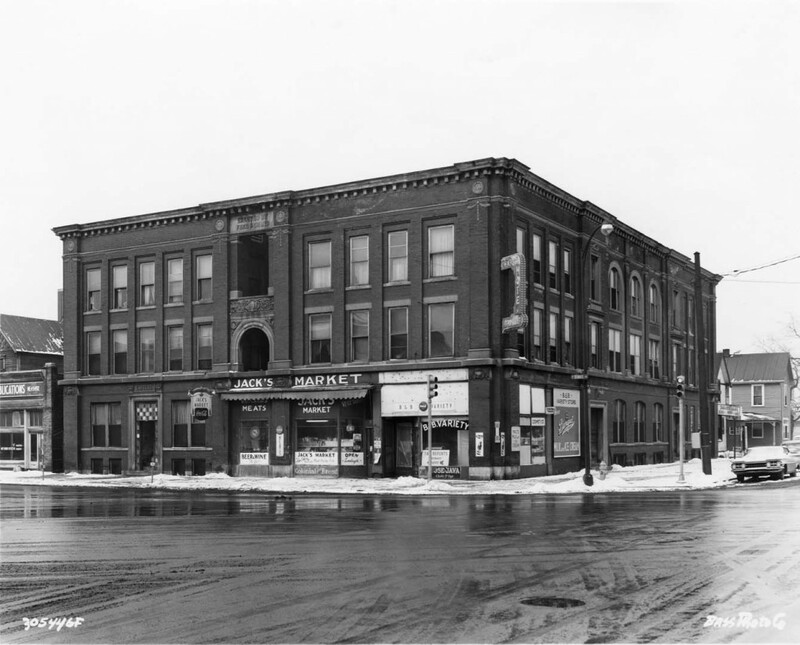 The Oxford was also briefly touched on in the National Register of Historic Places Massachusetts Avenue Commercial District form, as an example of a turn of the century mixed-use commercial structure. The Marietta flats were located at 229-235 East Vermont Street and 368-378 Massachusetts Avenue. 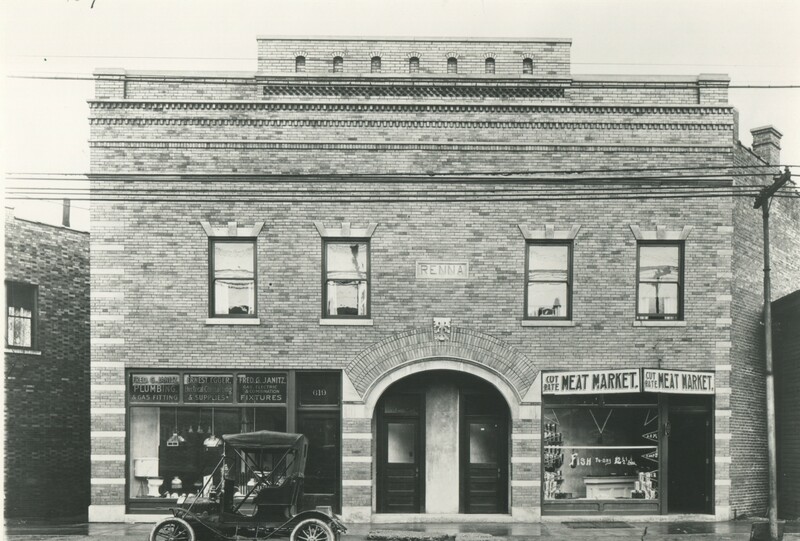 Built in 1905, this mixed-use commercial building was three stories and mostly contained twelve foot tall ceilings. 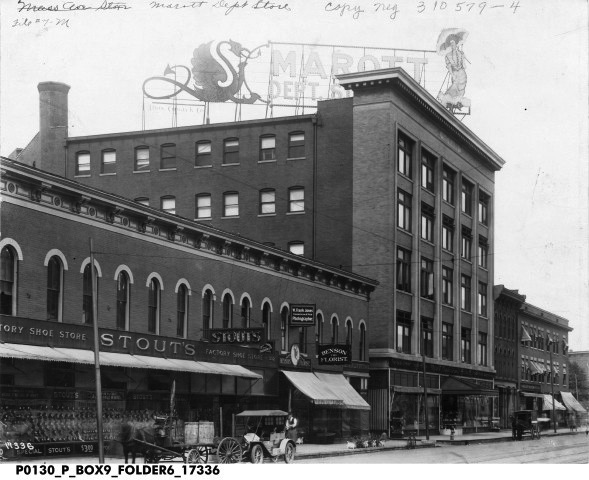 In 1914, the building was used as apartments on the second and third floors and a drug store and a paint store on the first floor. An advertisement from December of 1911 describes the flats as two rooms plus bath for $16/month. Popular architects Rubush & Hunter were involved with the primary construction or alterations soon after. The building was demolished for parking lots in 1952/1953, like many other lots nearby. Some discussions of luxury condos or apartments occurred in the 1980’s and 1990’s, but nothing ever came of it. The Marietta possessed a commercial Italianate Revival style due to its detailed cornice and lintels. Although usually symmetrical in plan, because of the corner lot placement it is slightly asymmetrical. 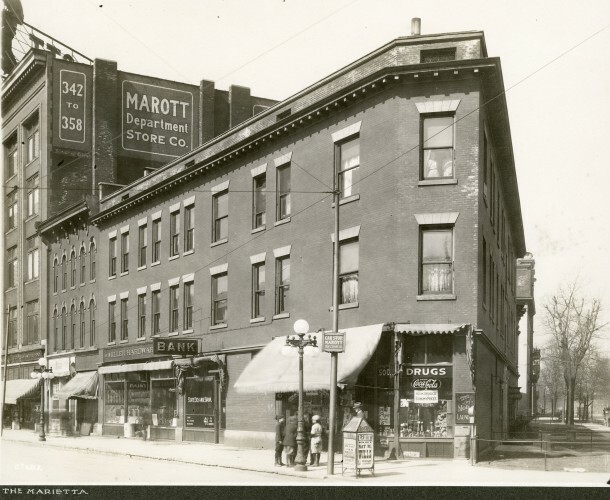 According to Hyman’s Handbook of 1907, seven of the most important streetcar lines and five interurban lines brought passengers to Marott Department Store, which was down the block from the Marietta. This area received a great deal of traffic as a shopping destination. Before the Marott, this large building was the Enterprise Hotel. A private hospital, Stout’s Shoes, and Bleecker Flats were nearby; the Roberts Park Methodist Church was across the street. Wish to stay with this informative series! Haha, you have, Basil! Every other Saturday I’m writing about apartment buildings built before 1906. My next one will be up Jan 12th. Cool! Glad to hear it! I recall The Alhambra across from Sears not far from the mall. Hard to believe this downtown neighborhood once had low-priced rentals.